We may be in the throes of preparing for Quilt Show 2018, but that doesn’t provide an excuse for missing Monday night’s meeting. We are very privileged to have Julie Adamson as our guest speaker. 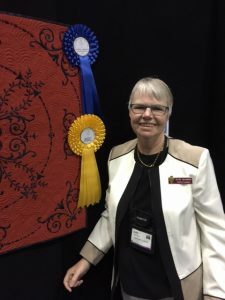 Julie specialises in hand appliqué and hand quilting and is an Accredited Teacher in Specialist Techniques with Victorian Quilters. She is also a multiple award winner with both Victorian Quilters and the Quilters Guild of South Australia including Best of Show, Runner Up Best of Show and Excellence in Hand Quilting. 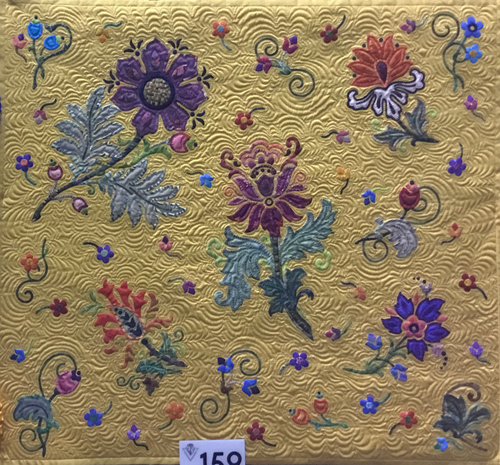 Her beautiful jacobean influenced quilt with the yellow background is in silk, and positively glows. Remember our temporary venue is Glen Waverley Community Centre, near the corner of Waverley and Springvale Roads. Members: Bring your Challenge Entries for the Quilt Show, or drop them off when you deliver your quilts on Friday 1st June. This entry was posted in Meetings, News and tagged Julie Adamson. Bookmark the permalink.